"One of my recurring objects of thought has been the slowness with which raw knowledge is assimilated. For example, I have been thinking about Broda Barnes’s work on the prevention of heart disease with thyroid extract. He did solve much of ‘the riddle of heart attacks,’ but recent statements by the Heart Association show that the dominant forces in the health business haven’t learned anything at all from his work, which he began 50 years ago. His work is clearly presented, not hard to understand, and it is scientifically so sound that no one challenges it, at least not on the scientific level. It is ignored, rejected by people who choose not to be bothered to read it. How many people have died from heart disease, since his work first became available? (And how many more from cancer, tuberculosis, and other diseases he showed occur mainly among hypothyroid people?)" This review addresses the hypothesis that thyroid insufficiency could be a significant cause of the heart disease and that the traditional thyroid medication (desiccated thyroid) could therefore be a logical strategy for an effective prophylaxis for heart disease. There is a considerable amount of studies carried out on this subject that aren’t very well-known despite their remarkable results. In addition to describing these studies conducted mostly in the middle of the 20th century, some parts regarding diagnosis, causes, and treatment of hypothyroidism are included. In the last few decades, a large part of the discussion related to heart disease (CVD) has been about cholesterol levels. The modern theories of heart disease often focus on the effect of LDL cholesterol in the genesis of atheroma plaques (in the intima part of blood vessels). This is also the reason why low-fat or low-saturated fat diets are recommended for the prevention of heart disease. Saturated fat is supposed to cause CVD by increasing the serum concentration of LDL cholesterol. It’s also the reason why a large amount of the western human population uses cholesterol-lowering drugs, statins. These results are quite good, but since we want to maximize the effectiveness of medications and even statins do leave a majority of people vulnerable to CVD deaths, it's always good to think about alternative ways to minimize the harms of cardiovascular disease. 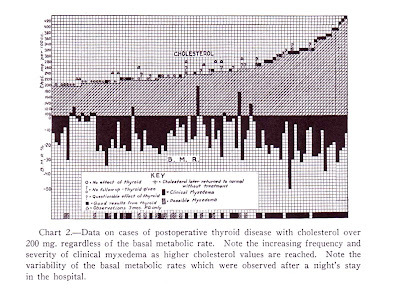 In 1951, physician William B. Kountz published his monograph Thyroid function and its possible role in vascular degeneration, in which he introduced his 5-year study with 268 subjects. As study subjects, Kountz had specifically chosen people with low basal metabolic rate (BMR; on average, 10 to 18 percent below normal). 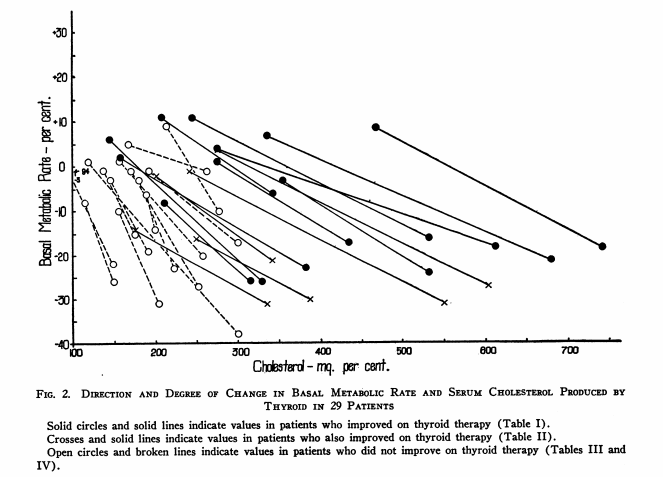 For the intervention groups he prescribed desiccated thyroid to raise their metabolic rate to the normal level. The control group did not get thyroid. Both groups got some B vitamins as well. There were three intervention groups plus their corresponding control groups. Group 1 consisted of middle-aged businessmen, Group 2 consisted of middle-aged office workers, and Group 3 consisted of elderly infirmary patients. The study results were promising. The rates of heart attacks were 85, 76 and 44 per cent lower in the intervention groups (group 1, 2 and 3). The reductions in mortality were similar, and are shown below. Two decades after Kountz’s research, physician James Wren conducted two studies which gave additional support to Kountz’s results. 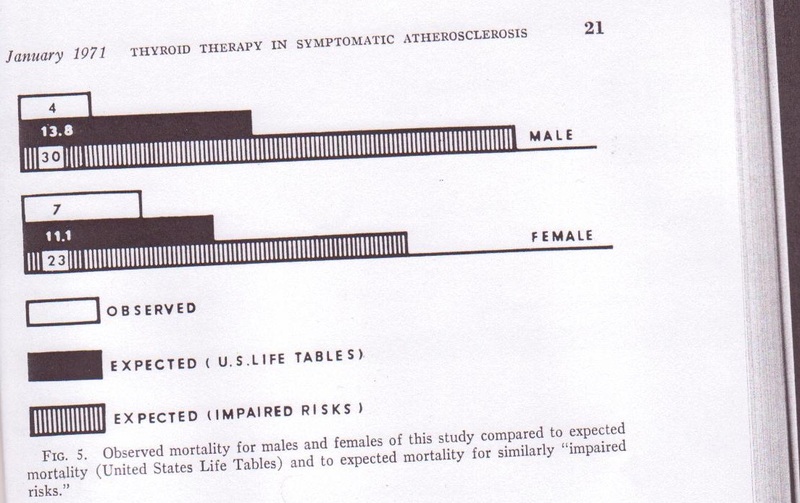 The first study, Thyroid function and coronary atherosclerosis, was published in 1968. During the two years, 74 CVD patients were given desiccated thyroid plus some vitamins. Forty-six controls were matched for the same number of intervention subjects. The results were positive. The thyroid treatment decreased subjects’ pains, improved their ECGs and lowered their cholesterol levels 17 per cent on average. 95 per cent of the subjects reported subjective benefit from the treatment. The difference in the mortality rates between the intervention and control group was six-fold (2 vs 12). 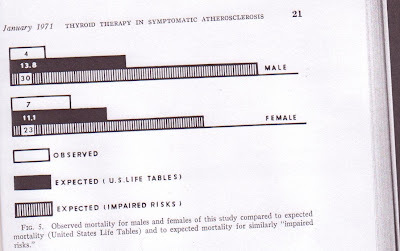 The results of a second and a little big larger study, Symptomatic atherosclerosis: prevention or modification by treatment with desiccated thyroid were published 1971. 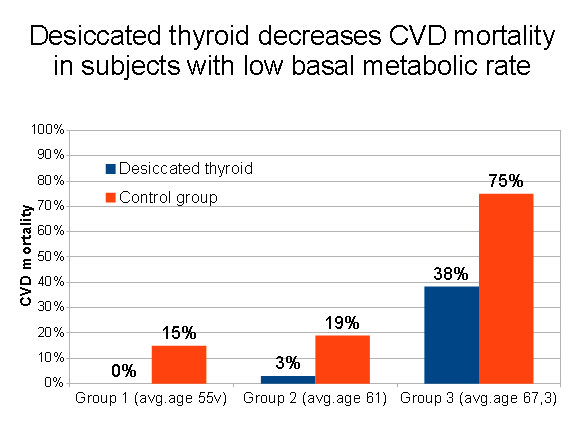 In this five-year study there were 347 CVD patients (1/3 of them were symptomatic), all of which were put on desiccated thyroid medication even though only 9 per cent of them had hypothyroidism based on the blood tests. There was no control group, but during the five years of study there were half as many deaths as the statistics would have predicted for the people of the same age. When a rough adjustment for the risk factors (heart disease, hypertension etc) was made, it was clear that the subjects had a fortunate survival rate. Their mortality was only one fifth of the expected number (11 vs. 53). Physician Broda Otto Barnes‘ dissertation, published in 1932, was related to the function of the thyroglobulin protein. In the beginning of his medical practice, he noticed that many of his patients had symptoms that were similar to mild hypothyroidism. After noticing this, he began prescribing desiccated thyroid to a large part of his patients. Barnes didn’t diagnose hypothyroidism based on his patients’ blood tests or basal metabolism (BMR), but instead he claimed that basal temperature is a more accurate marker of thyroid hormone function and health. His essay on that subject, Basal temperature versus basal metabolism, was published in 1942 in The Journal of the American Medical Association. In that article, Barnes wrote that he told his patients to measure their axillary temperature immediately after waking up. Temperature lower than 36.5 celcius (97.8F) was an important indicator of hypothyroidism and thus, a need for a prescription of desiccated thyroid. Thirty years later, in 1973, Barnes published some of his patient data in his article On the genesis of atherosclerosis. The occurrence of CVD in his 1500+ patients was 94% lower than Framingham statistics would have predicted. This is a remarkable result considering that Barnes didn’t advocate his patients to quit smoking or change their other habits. I think it’s wise to mention one of Barnes’ other papers too, Prophylaxis of ischaemic heart-disease by thyroid therapy (1959), published in Lancet. The paper shows that thyroid treatment lowers high cholesterol levels very reliably. For his study, Barnes chose 80 persons who had high cholesterol (>200mg/dl). Usually the cholesterol levels fell to the range of 170-200mg/dl or 4.4-5.2 mmol/l after the patients had been on their thyroid medication for a sufficient duration. Physician Mark Starr (who has written a book Hypothyroidism Type 2: The Epidemic) has treated his patients according to Broda Barnes’ recommendations. In his book, he mentions that despite having treated over 1600 patients, only two have had a heart attack. Now we have gone through the clinical data regarding prevention of heart disease with thyroid. Next, we are going to look at some indirect evidence from other kinds of studies. Clinical (and some studies, subclinical) hypothyroidism is associated with increased levels of homocysteine and Lp(a) and increased plasma viscosity. Increased levels of fibrinogen have also been found in subclinical hypothyroidism, but T4 didn’t lower it. (Kutluturk et al. 2013, Adrees et al. 2009, Caraccio et al. 2002, Hussein et al. 1999, Catargi et al. 1999, Erdem et al. 2008, Cakal et al. 2007). 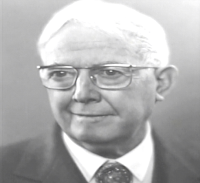 Pathologist Nikolai Anichkov is considered a very important person in the history of cholesterol theory. He showed that “without cholesterol there’s no atherosclerosis.” In 1912, he fed rabbits with cholesterol in vegetable oil medium, and because of this, rabbits developed atherosclerosis. In 1933 Anichkow stated that this rabbits’ atherosclerosis is similar to human atherosclerosis. Hypertension is an important risk factor of CVD. Desiccated thyroid seems to be a quite potent medication for hypertension. - the prevention and control of atherosclerotic arterial disease." "Today, statins are used as the first treatment choice to lower plasma total and LDL cholesterol levels, but high-risk patients still experience further events of CHD. Thus, there is a need for novel pharmacological strategies. Preclinical and clinical studies using selective [thyroid hormone] analogs are promising and suggest TRβ1 as a potential target for treatment of dyslipidemia." 8. Regarding the diagnostics: Is the incidence of hypothyroidism underestimated? One important thing to remember now is that none of the physicians who saw reduced heart disease in their patients using desiccated thyroid (Kountz, Wren, Barnes, Starr) diagnosed their patients according to the typical guidelines, but instead they based their diagnoses on other markers such as basal metabolic rate, basal metabolism and heart disease. Here in Finland, it’s generally accepted that no more than half a million Finns suffer from thyroid symptoms. That would equal nine percent of the Finnish population. However, some doctors such as Broda Barnes have stated that there are probably a lot more people who would benefit from thyroid treatment. 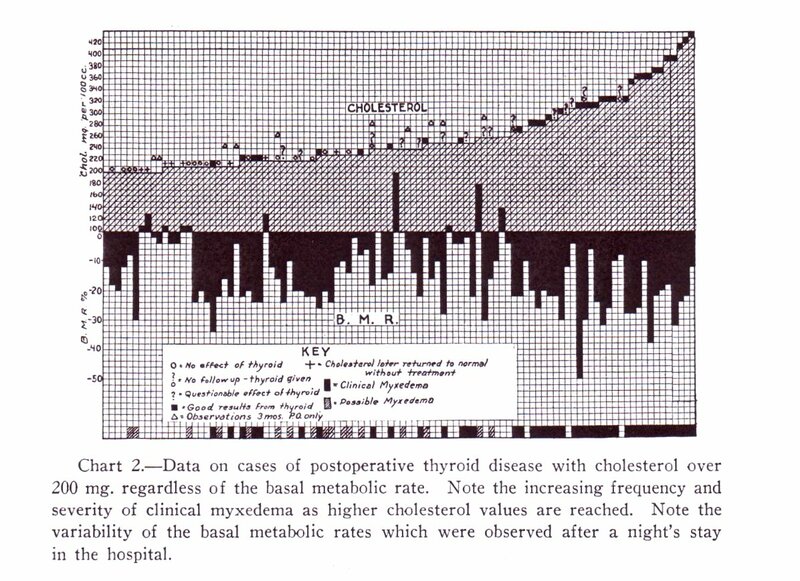 According to Barnes, in 1976 approximately 40% of Americans had symptoms of hypothyroidism. 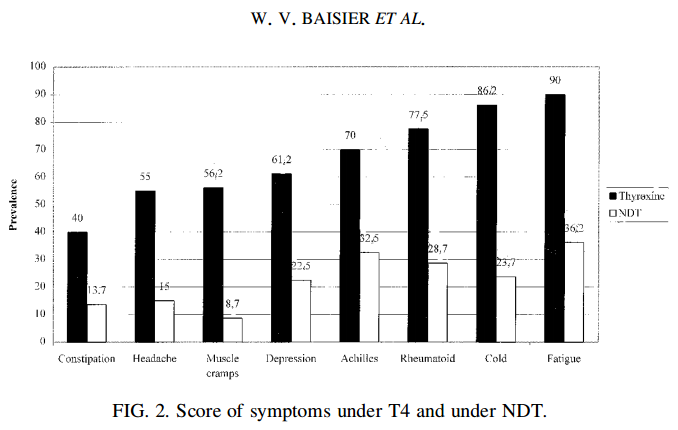 In 1989, Jacques Hertoghe estimated that in Belgium, up to 80 per cent of the population suffered from hypothyroid symptoms. In common language, “hypothyroidism” refers mainly to primary hypothyroidism, in which the thyroid gland doesn’t produce thyroid hormones normally, and because of that TSH levels are high and T4 and/or T3 levels are low. The most common reason for primary hypothyroidism is Hashimoto’s thyroiditis. It's quite common especially in women. However, in addition to actual hypothyroidism, some groups seem to suffer from a low metabolism and various symptoms which seem to be alleviated or cured by thyroid extract. I think that some mechanism other than low thyroid hormone concentration in serum could cause hypothyroid symptoms. The mechanism is probably related to function of receptors and target tissues. Maybe many people have underlying metabolic problems caused by deficiencies, infections or other things, which inhibit thyroid hormone function and aerobic metabolism on the tissue level. In the above studies examining the possibility prophylaxis of heart disease with thyroid hormone, natural desiccated thyroid was used instead of synthetic hormones. As a medication, NDT became popular in the ’30s, but after the sixties the synthetic hormones have replaced them almost completely. So nowadays most hypothyroid patients receive T4 monotherapy. Sometimes but still quite rarely patients are treated by synthetic combination therapy (T4+T3), sole triiodothyronine (T3) or desiccated thyroid (NDT; Armour Thyroid being the most popular trademark). Can it be said that one of these medications is better than the others? There is also a huge amount of discussion about various types of thyroid therapy on the Internet (social media). I’m quite impressed about the numerous anecdotes of better results with NDT (or combination) therapy compared to T4 monotherapy. Many of these patients also report that their medication suppresses their TSH to about zero. The function of thyroid hormones is related to a large amount of metabolic processes, so it wouldn’t be very illogical to think that in some people, the inadequate metabolic rate (or thyroid function) could be related to their diet or lifestyle. Below I demonstrate some of the possible associations between diet, lifestyle, thyroid hormone function and CVD. I have been thinking that the additions of iodine and selenium to the Finnish food supply might have been one of the main contributors to the decline in coronary heart disease during the North Karelia project. The common view is that the project decreased CVD mortality by advocating people to eat less saturated fat (SFA) and to start exercising. Obviously, there are plenty of associations between nutrients and thyroid function. Stress - Those who have read Robert Sapolsky’s popular book Why Zebras Don’t Get Ulcers or any other similar work, are aware of the fact that chronic stress can make one more susceptible to a large amount of diseases. A popular health-blogger, Chris Kresser, has written about some mechanisms of stress-induced hypothyroid symptoms. Deficiency of red light and near-infrared radiation - I have written about the fact that red light and near-infrared radiation increase the tissue metabolism and decrease inflammatory cytokines in blood, by activating the mitochondrial enzyme cytochrome c oxidase. Because higher exposure to near-infrared light seems to be beneficial to health, we can assume that a large percentage of population is getting too little of it. Some of the best sources of near-infrared radiation are sunlight, incandescent lamps, heat lamps and low-level laser therapy (LLLT), which is the most common treatment used in the studies. In 1976, Broda Barnes published his book Hypothyroidism: The Unsuspected Illness. In the book he claims that there are numerous diseases which often can be cured or relieved with desiccated thyroid. The list includes health problems such as fatigue, migraine, mental health issues, frequent respiratory infections, menstrual irregularities, hypoglycemia, acne, and the vasculary complications of diabetes. Check the Appendix I for some studies about these ailments. Desiccated thyroid, as a medication, has been studied a few times for prophylaxis of heart disease on clinically euthyroid (normal hormone levels) people. Without exception, the results have been very favourable: In the studies, the cardiovascular mortality in thyroid-treated patients has been less than a fourth of normal. The best effect was seen in people with no background of heart disease. These studies also raise some questions concerning the diagnosis and treatment of hypothyroidism. Modern blood tests seem to leave a significant amount of people with hypothyroid symptoms undiagnosed, so maybe some other tests such as basal temperature, symptoms, basal metabolic rate and total cholesterol, could be useful in the diagnosis of thyroid hormone insufficiency. We should also consider that desiccated thyroid could be a more useful medication than thyroxine monotherapy, and that sometimes the optimal dosage of thyroid hormones will suppress TSH below the “normal” range. The medical experts do not usually discuss the studies I’ve been talking about here. One plausible reason could be the fact that these studies do not follow the current RCT gold standard. On the other hand, lack of adequate data doesn’t imply lack of efficacy, and we are faced with the problem that to this date the clinical data on this subject seems to point to the direction that desiccated thyroid could be a very valuable tool in the prevention of the heart disease. Scroll down past the endnotes to comment. *** The absolute difference was just 11-16µg depending on the time of the year, but even these minor amounts might have physiological significance because the total intake of iodine by Finns was as little as 51-71µg per day. 1937: Litzenberg JC: The endocrines in relation to sterility and abortion “Since 1922 I have studied the relation of the basal metabolic rate to sterility, abortions and menstrual disturbances. In our first small series of sixty-nine consecutive women, in whom no other evidence of myxedema was present, 50 per cent had a low basal rate; adding those who had conceived but aborted, the figure was 56 per cent. Carefully supervised thyroid medication resulted in 33.3 per cent conception, 14 per cent of whom aborted. [...] Haines and Mussey of the Mayo Clinic confirmed our thyroid treatment of functional menstrual disturbances, saying: “Because of a desire to determine the effectiveness of thyroid medication alone, in the treatment of certain menstrual disturbances, no patient received any other treatment. All were definitely improved; amenorrhea, 72 per cent; oligomenorrhea, 55 per cent; menorrhagia, 73 per cent, and general health, 75 per cent.”"
1938: Turner et al: The role of the thyroid in the regulation of the cholesterol of rabbits. Barnes BO: The treatment of menstrual disorders in general practice. [From Barnes' book: "In 1949, I published a report on 143 women with menstrual disorders whom I had seen in my practice and for whom, after taking a thorough history and carrying out a complete physical examination including examination of the pelvis, I had prescribed thyroid therapy. These were women without evidence of fibroids, ovarian cysts, or any other organic disease. In some, basal metabolism test indicated thyroid deficiency; in others, the basal temperature test was used. Forty-eight of the women suffered from menstrual cramps. 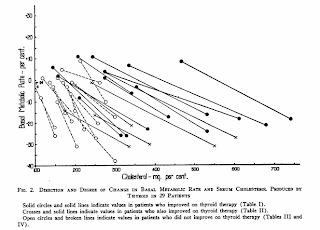 Only five failed to get some relief from thyroid therapy; thirty-five experienced complete relief. Forty-five of the women had irregular cycles. Forty-three benefited, with the cycles becoming completely regular in forty-one. 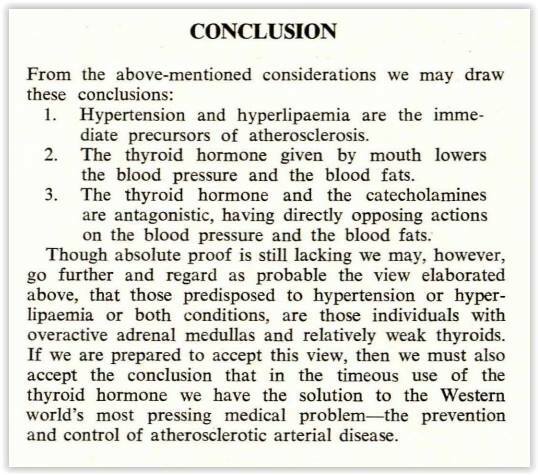 1958: Wallach et al: Cardiac disease and hypothyroidism; complications induced by initial thyroid therapy. Uotila et al: Goitre and atherosclerosis. "In hypothyroidism an excessive amount of thyrotrophic hormone is secreted. 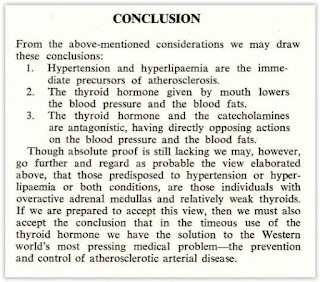 In addition to its stimulating effect on the thyroid gland, thyrotrophin affects connective tissue directly by increasing its mucopolysaccharide content (Asboe-Hansen and Iversen 1951). It also prevents the maturation of granulation tissue whereas growth hormone promotes it (Saikku 1956). We think it likely that the acknowledged tendency of hypothyroid patients to arteriosclerosis is attributable not only to a raised serum-cholesterol level but also to the overproduction of thyrotrophin." Hesch et al. Treatment of dopamine-dependent shock with triiodothyronine. 1985: Katamine et al. Effects of the long-term (17-19 months) feeding of high-iodine eggs on lipid metabolism and thyroid function in rats. Sarne&Refetoff: Measurement of thyroxine uptake from serum by cultured human hepatocytes as an index of thyroid status: reduced thyroxine uptake from serum of patients with nonthyroidal illness. "In patients with NTI, the results of in vitro estimations of free T4 do not always correlate with the transfer of T4 to tissues, as assessed by T4 uptake in human hepatoma cells. In patients with NTI, equilibrium dialysis may overestimate and resin uptake measurements may underestimate the amount of T4 taken up by tissues. In some patients with severe NTI, tissue uptake of T4 is reduced." Staub et al: Spectrum of subclinical and overt hypothyroidism: effect on thyrotropin, prolactin, and thyroid reserve, and metabolic impact on peripheral target tissues. "In grade I subclinical hypothyroidism (basal TSH below 6 mU/L), we found significant changes in the clinical index (p less than 0.05), apoprotein A-I level (p less than 0.05), and stimulated prolactin level after oral TRH (p less than 0.001). The findings were similar in grade II (TSH 6 to 12 mU/L). Further changes could be demonstrated in grade III (TSH above 12 mU/L) with a definite elevation of ankle reflex time (p less than 0.001), serum myoglobin level (p less than 0.01), and, to a lesser extent, creatine kinase (p greater than 0.1). The mean low-density lipoprotein cholesterol (LDL-C) level showed an increase of 18%, which was not significant because of marked individual variations (p = 0.15)." Hanna et al. Inhibition of low density lipoprotein oxidation by thyronines and probucol. Boelen et al. Soluble cytokine receptors and the low 3,5,3'-triiodothyronine syndrome in patients with nonthyroidal disease. "The variability in serum T3 was accounted for 35% by changes in ln (sTNF alpha R p75) and 14% by changes in ln (IL-6)." 1996: Escobar-Morreale et al. Only the combined treatment with thyroxine and triiodothyronine ensures euthyroidism in all tissues of the thyroidectomized rat. Klemperer et al. Triiodothyronine therapy lowers the incidence of atrial fibrillation after cardiac operations. "Triiodothyronine-treated patients had a lower incidence of atrial fibrillation (24% versus 46%; p = 0.009), and fewer required cardioversion (0 versus 6; p = 0.012) or anticoagulation (2 versus 10; p = 0.013) during hospitalization. Six patients in the T3 group versus 16 in the placebo group required antiarrhythmic therapy at discharge (p = 0.019)." 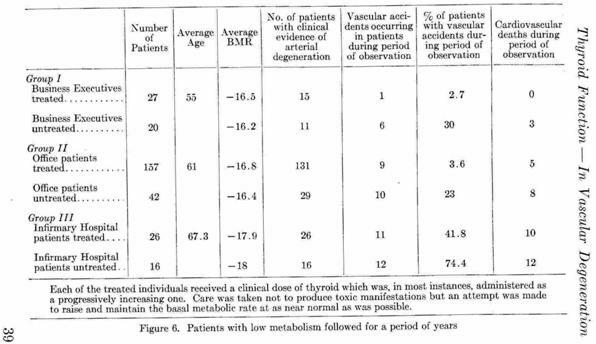 1997: Zulewski et al: Estimation of tissue hypothyroidism by a new clinical score: evaluation of patients with various grades of hypothyroidism and controls. (1997) "In overt hypothyroid patients, the new score showed an excellent correlation with ankle reflex relaxation time and total cholesterol (r = 0.76 and r = 0.60; P &lt; 0.0001), but no correlation with TSH (r = 0.01)." 2002: Rosenbaum et al. Low dose leptin administration reverses effects of sustained weight-reduction on energy expenditure and circulating concentrations of thyroid hormones. Koyuncu et al: Effect of thyroid hormones on stress ulcer formation. "It was found that both triiodothyronin and thyroxin reduce the length and depth of the stress ulcers (P < 0.001)." Clejan et al. Blood histamine is associated with coronary artery disease, cardiac events and severity of inflammation and atherosclerosis. "Histamine and isoprostane levels increase in SCAD and ACS patients. Mast cell activation and lipid oxidation generated during atherosclerosis manifest this inflammatory response. Accelerated isoprostane formation and depleted ascorbate paired with histaminemia is active in CAD and predispose patients to acute coronary syndrome. Blood histamine alone may be a better risk factor for coronary events, and a better prognostic indicator than CRP even when combined with lipid indexes." Solá et al. Massive triiodothyronine intoxication: efficacy of hemoperfusion? "A case of massive accidental triiodothyronine intoxication (1000-fold the usual therapeutic dose, for 8 days) is reported with important disturbances of cardiovascular and central nervous systems that required intensive care support. Serum free triiodothyronine levels were 4789 pmol L(-1) on admittance (normal values, 3.5-6.5 pmol x L(-1)). In the absence of a specific treatment, hemoperfusions were performed but failed to accelerate significantly the decay of blood levels of free triiodothyronine (apparent half-life 25.9 hours; 95% confidence interval: 19.8-37.4 hours). The patient, a young woman, made a satisfactory recovery, in spite of important clinical complications." Nevin&Rajamohan: Beneficial effects of virgin coconut oil on lipid parameters and in vitro LDL oxidation. Faure et al. Thyroid hormone (T3) and its acetic derivative (TA3) protect low-density lipoproteins from oxidation by different mechanisms. Nakahara et al: Association of antipituitary antibody and type 2 iodothyronine deiodinase antibody in patients with autoimmune thyroid disease. "[antipituitary antibody] was positive in 31.0% (13/42) of patients with Hashimoto's disease" "D2 peptide antibody was positive in 26.2% (11/42) of patients with Hashimoto's disease"
Alvarez-Pedrerol et al. TSH concentration within the normal range is associated with cognitive function and ADHD symptoms in healthy preschoolers. "Children with TSH concentrations in the upper quartile of the normal range performed lower on McCarthy's scales and were at higher risk for attention deficit and hyperactivity/impulsivity symptoms. In the Menorca cohort, a decrease of 5.8 (P < 0.05) and 6.9 (P < 0.01) points was observed in memory and quantitative skills, respectively. 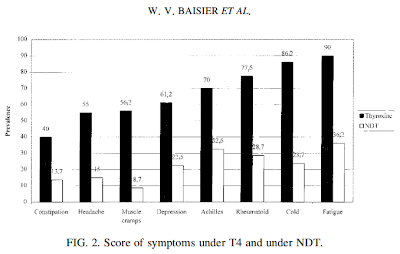 In contrast, high T4 concentrations were associated with decreased risk of having 1-5 attention deficit symptoms (odds ratio: 0.25; P < 0.01);"
Wikland B: Redefining Hypothyroidism—A Paradigm Shift “A direct approach to demonstrate thyroid autoimmunity is to examine the gland by means of fineneedle aspiration cytology (FNA). For many years, this has been a routine procedure in our centre in Stockholm, Sweden. The diagnostic and therapeutic potential of FNA as a complement to conventional first-line tests is remarkable. In summary, we  found that no less than 40% of unselected patients with chronic fatigue (90% women) had definite evidence of lymphocytic invasion of the thyroid—the gold standard criterion of thyroid autoimmunity. 2010: Kuppens et al. Maternal thyroid function during gestation is related to breech presentation at term. Celi et al. The pharmacodynamic equivalence of levothyroxine and liothyronine: a randomized, double blind, cross-over study in thyroidectomized patients. "This is the first study addressing the equivalency between L-T3 and L-T4 therapy measured by baseline and TRH-stimulated TSH. The therapeutic substitution of L-T3 for L-T4 was achieved at approximately 1:3 ratio." Gullo et al: Levothyroxine Monotherapy Cannot Guarantee Euthyroidism in All Athyreotic Patients "Among the levothyroxine-treated patients 15.2% had lower serum FT3 and 7.2% had higher serum FT4 compared to euthyroid controls." Ito et al. TSH-suppressive doses of levothyroxine are required to achieve preoperative native serum triiodothyronine levels in patients who have undergone total thyroidectomy. Goldberg et al: Thyroid hormone reduces cholesterol via a non-LDL receptor-mediated pathway. "We tested whether LDL receptor (LDLR) expression was required for cholesterol reduction by treating control and LDLR-knockout mice with two forms of thyroid hormone T(3) and 3,5-diiodo-l-thyronine. High doses of both 3,5-diiodo-l-thyronine and T(3) dramatically reduced circulating total and very low-density lipoprotein/LDL cholesterol (∼70%) and were associated with reduced plasma T(4) level. The cholesterol reduction was especially evident in the LDLR-knockout mice." Nicolini et al. New Insights into Mechanisms of Cardioprotection Mediated by Thyroid Hormones “Experimental and clinical studies strongly support the concept that TH plays a fundamental role in cardiovascular homeostasis in both physiological and pathological conditions. 2014: Hoermann et al. Homeostatic Equilibria Between Free Thyroid Hormones and Pituitary Thyrotropin Are Modulated By Various Influences Including Age, Body Mass Index and Treatment. "FT3 levels were significantly lower in L-T4 treated versus untreated non-hypothyroid autoimmune thyroiditis (median 4.6 vs 4.9 pmol/l, p<0.001), despite lower TSH (1.49 vs 2.93 mU/l, p< 0.001) and higher FT4 levels (16.8 vs 13.8 pmol/l, p< 0.001) in the treated group." “In 1998, I recruited a Ph.D. exercise physiologist to perform basal metabolic rate testing for my pain patients. The doctor was very conscientious and tried to make certain the patients were relaxed and proper procedures followed. He performed basal metabolism tests on 50 consecutive pain patients. All of these patients had normal thyroid blood tests. “The hypothyroid patient may experience effects like those produced by anemia, including undue fatigue, for another reason. Thyroid deficiency tends to reduce the strength of the heartbeat, and the amount of blood pumped out to the body with each beat is reduced. National Academy of Hypothyroidism – How Accurate is TSH Testing? Thyroid Patient Advocacy – Why does the Thyroid Stimulating Hormone (TSH) reference range in the UK remain the widest in the world? Check out Dr Tom Cowan's article on the WAPF website about the cause of heart disease as well, perhaps you can see possible links with this information and the thyroid. The article is called. What causes Heart Attacks? I think that this information when put together with what you are discussing may enlarge the discussion and raise some questions, and perhaps shed greater light on both perspectives. As well, consider checking out the work of Brian Peskin, whether you would fully agree with him at this point or not, I think that if you put it together with the information provided by Dr Tom Cowan in his article, and what you are discussing, that you may get an even better view of the whole picture here. Finally, you very intelligently, and rightly so, discuss various nutrients and/or mineral deficiencies that may exist that contribute to thyroid and/or heart disease/diabetes, and, I would like to add the importance of sulfur deficiency, which, along with the other nutrients and/or minerals you mention, I think, if you were to do an indepth look at this, you would think is very significant. Check out the work of Dr Stephanie Seneff, PhD on this, as well as find what you can online about Patrick mcGean and his work with organic sulfur. Hi Anonymous, and thanks for the recommendations! I'm already quite familiar with Seneff's work but I think I should re-read the sulfur article because it's probably sth like two years since reading it. The other authors are quite unfamiliar to me. Gonna check their sites in the near future. The link for Dr Cowan's article is http://www.westonaprice.org/cardiovascular-disease/what-causes-heart-attacks. Re Brian Peskin's work see his website www.brianpeskin.com. For Stephanie Seneff and sulfur, of course you can find her work at her website. Check out this article about organic sulfur and Patrick McGean athttp://www.encognitive.com/node/1123. His son had testicular cancer and was given a 3% chance of living afer all conventional therapies failed. He is alive today. He started using organic sulfur. The common denominators to all this seems to be the importance of getting oxygen to the cells of the body somehow. Apparently selenium, tellurium, and sulfur are what do this. I looked for an email to contact you directly but, could not find one. Can you list it in a reply to this comment? 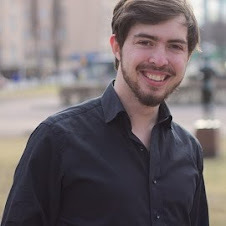 Thanks Valtsu, just found this article. Given that thyroid hormone is a secondary treatment, what do you think may be the primary causes of the subclinical hypothyroidism and associated CVD? Is it just iodine and selenium deficiency? In some cases iodine and selenium can help, but I don't know if there even is a "primary" nutritional cause, because there are probably very many things that can lead to malfunction of organism, or the thyroid gland. - LLLT (low-level laser therapy with near-infrared light). Höfling et al. has studied this, you can find the links from this article. I think that near-infrared light just generally improves tissue metabolism and reduces inflammation, and could therefore even cure hypothyroidism in some cases. Hey I just finished reading your blog and I think it's extremely informative. My family has a history of coronary heart disease and this kind of freaks me out. I'm a very health conscious person and I don't ever want to get sick. I'm just 24 right now but still I'm getting a bit obsessed with the idea of ever having a heart disease. I was just reading your blog to have an idea about any symptoms I might experience. Thanks. It's "hard" cheese not "head" cheese btw! It’s a nice article. This is very helpful to me. I always keep this tips in my mind. Thanks for sharing such informative post. Muskan is an NGO to support heart attack patients in India.The goals of the step down unit are to optimize the patient's condition and prepare them to go home.